The Beatles can not have meant Oscar Cadiach when they wrote the lyrics for their song “When I’m sixty-four”: “Yours sincerely, wasting away”. The Spanish climber is 64 years old but nothing could be further from wasting away. He is certainly fitter than most 32-year-olds. 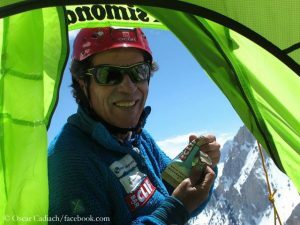 Today, Oscar completed his big project: The Catalan summited the 8051- meter-high Broad Peak in the Karakoram and has now stood on top of all 14 eight-thousanders without having used bottled oxygen. 33 years ago, Cadiach had scaled his first eight-thousander, also in Pakistan: Nanga Parbat.